In the span of just over a week, Nyjer Morgan has transformed himself from one of the game’s more anonymous players into one of its greatest villains. Nyjer Morgan isn't signaling touchdown, although his actions did help turn last night's contest against the Marlins into a football game (Photo: AP). Morgan’s troubles started back on August 21, when he threw a ball into the stands and struck a fan in the head during the eighth inning of a game at Citizens Bank Ballpark in Philadelphia. Earlier in the game, the Nationals’ center fielder had been carrying on a contentious conversation with fans in that section, prompting an investigation that concluded with the handing down of a seven game suspension. Morgan quickly appealed the suspension, and a hearing was set for September 7. So, you’d probably imagine that he would be on his best behavior in the interim? Guess again. Instead of treading lightly while under the threat of suspension, Morgan went on a home plate collision rampage that eventually culminated in a benches clearing brawl last night in Florida. For those who haven’t seen the highlights, Marlins pitcher Chris Volstad plunked Morgan in apparent retaliation for his home plate collision with rookie catcher Brett Hayes in the previous night’s game. Hayes, who was not blocking the plate, suffered a separated shoulder, which likely added fuel to the fire. After getting hit, however, Morgan then took it upon himself to steal second and third despite his team trailing by 10 runs. Apparently, this action also didn’t sit well with the Marlins because in his next at bat, Volstad tried to hit Morgan again. This time, however, he missed with the pitch and Morgan came charging after him. Obviously not intimidated by the smallish Morgan, the 6’ 8” Volstad threw down his glove in anticipation of the impending confrontation. As Morgan approached the towering pitcher, he actually had to leap in the air to deliver his first punch, but before anything further could develop, Marlins first baseman Gabby Sanchez came charging in and close-lined him to the ground. From there, the usual pile-up ensued. When the dust settled, Morgan was seen walking off the field gesticulating to the crowd in WWF style, actions now befitting his new reputation as baseball’s bad boy. To say Morgan’s behavior has been bizarre would be an understatement. Although Morgan is not known to be the brightest player on the field, he never seemed to have any behavioral issues. In fact, when the Nationals acquired him from the Pirates for Lastings Milledge, it was the Nationals who were thought to be shedding the problem player. Oh, the irony. Morgan’s litany of transgressions, all coming on the heels of a pending suspension, demand that MLB take immediate and decisive action. For starters, Morgan’s appeal hearing should be held immediately, but not before an extended suspension is levied. Morgan’s reckless behavior over the past 10 days should not be tolerated, so like Hayes, Morgan’s season should also now be over. More important than disciplining Morgan, however, major league baseball needs to finally address the issue of barreling into the catcher at home plate. For some reason, baseball has long tolerated violent collisions with catchers, whether they are blocking the plate or not. However, the rules clearly state that such an action is illegal. What’s more, the practice of a catcher blocking the plate without the ball is also against the rules…it isn’t good defense, it’s obstruction. By simply enforcing the rules already on the books, baseball could avoid these senseless collisions that not only threaten injuries to catchers and runners alike, but also violate the spirit of the game. The NFL season starts in the fall. Major league baseball should not be providing previews during the summer. August 21: During a game in Philadelphia, Morgan argues with fans before throwing a ball into the stands. August 28: Morgan makes contact with Cardinals catcher Bryan Anderson despite the latter having his back to the plate without the ball. Morgan was eventually called out because he only touched the plate later with the assistance of another player. After the game, Nationals manager Jim Riggleman criticized his player and opined that his aggression may have stemmed from anger over being moved down to 8th in the batting order. August 31: In the 10th inning of a scoreless game, Morgan collides with Marlins catcher Brett Hayes, who was not blocking the plate. Had he slid instead, Morgan would have likely scored the go ahead run, but his decision to go for contact not only resulted in an out, but a serious injury to Hayes. Later in the game, Morgan is caught on tape cursing at fans in the stands (see below). September 1: Nyjer Morgan charges the mound after a second attempt to hit him with a pitched ball. 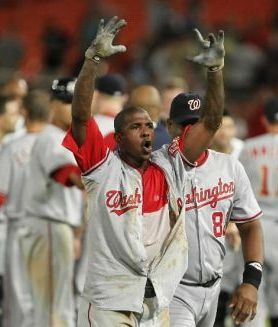 After the ensuing brawl, Morgan rips off his jersey and makes profane and aggressive gestures while walking off the field. You mentioned the catcher was not blocking the plate. In the picture you linked to, the catcher doesn’t even have the ball. In fact, he is reaching up for it with his head turned from the runner. That is not “blocking” the plate. If you watch the video, the entire plate is open to Morgan. In fact, if he slides, he scores. The only reason he was out was because he decided to slam into the catcher.